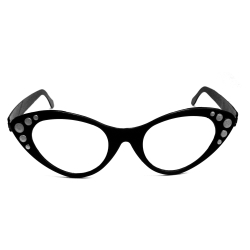 Black 1950’s style women’s cat eye glasses without lenses. These glasses are made of a rigid and durable plastic and have gray faux gem accents. They are very popular for an affordable Halloween costume, as a quick costume for a 1950’s themed party, or for use by our directors who are doing “Grease” or other 1950’s period plays and are on a budget.